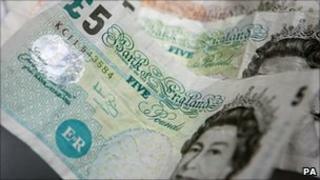 Businesses plan to cut back on capital investment as the UK economic outlook remains gloomy, a report suggests. The Institute of Chartered Accountants in England and Wales (ICAEW) says as well as reining in capital spending, firms are cutting back on job creation. The ICAEW/Grant Thornton business confidence monitor shows a negative outlook, at -9.3 in the third quarter as against +8.1 a year earlier. The ICAEW said it all pointed to the UK returning to recession. The findings came just days after an influential think tank said the UK economy would enter recession in the first half of the year as households continue to cut back. The National Institute of Economic and Social Research said the government should temporarily ease its spending cuts to promote growth. "With the confidence Index pointing to a double-dip recession, the report gives little comfort to government as it seeks to drive growth in the UK economy," the ICAEW said. The chartered accountants' organisation also said that close to one-fifth of UK businesses had above normal stock levels, "probably due to a lack of customer demand and over half of businesses are operating below capacity". Pay expectations for this year, it added, were depressed with businesses predicting modest increases of up to 2% - "more unwelcome news for the squeezed consumer". "This survey shows that businesses are responding to concerns about the economic outlook by cutting back on investment in equipment and people," said Michael Izza, chief executive of ICAEW. "This is at a time when government desperately needs businesses to be growing. "At the moment, it is hard to see where this growth will come from and the Chancellor needs to use the forthcoming budget to give businesses reasons to be more confident about the future - and unlock potential investments." The report also said that small and medium sized firms were more likely than larger companies to take on people in the next 12 months.